What an amazing Hatfield House Jewish Wedding celebration this was at this historic Banqueting Hall in Hertfordshire. It really was a fun day to be the wedding photographer at Hatfield House, one of my favourite wedding venues. Yes, it’s local to me so I don”t have a really long drive. But it’s also such a great place to celebrate with your family and friends. It also has great potential for some stunning wedding photography. Before I got to Hatfield House, I began with the preparations. A quick stop with the guys before heading over to photograph the final preparations with Amy. 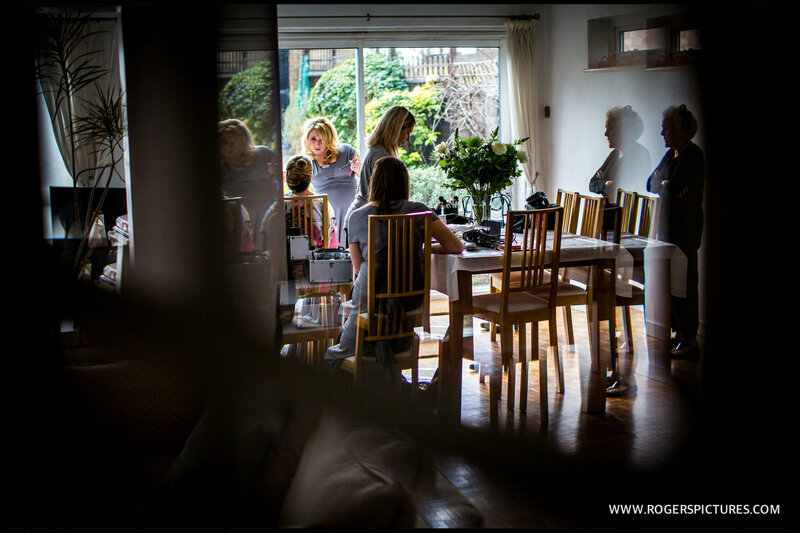 There was a lot of fun and laughter while Amy and her sister got ready with the bridesmaids and their parents. We were lucky with the weather, and some clear skies gave me excellent light to work with. A favourite moment for me to capture at any wedding is the ‘first look’ that the Brides father has when the bride is fully dressed. Amy and her Dad didn’t disappoint here. At Hatfield House the Riding School was the venue for the ceremony. The room and chuppah looked fabulous thanks to Julia at Two Girls And Some Flowers. As Amy arrived with her Father, Anthony and the guys were in a side room for the Tish before signing the Ketubah. Amy and her parents arrived in the upstairs gallery for the Badeken, when the groom unveils his bride. Following the ceremony, the guests enjoyed some drinks and canapés while we did the group pictures and some portraits around the gardens, where we were again lucky with the light. The evening celebrations kicked off with some traditional Israeli dancing in the Banqueting Hall in the Old Palace, a space dripping in history going right back to Elizabeth I in the 15th Century. The speeches took the celebrations on into the evening and the dancing was still in full flow when our coverage ended. Huge thanks to Manchester wedding photographer David Stubbs for his help photographing this wedding with me. If you’re planing a wedding at Hatfield House, or anywhere else, and enjoy this style of documentary wedding photography, please go to the contact page to send me a message to check my availability.